With bathroom rugs lying in the bathroom, you cannot keep using it for months without cleaning them since they are as useful as other things like tub, sink, or toilets. Most importantly, bathroom rugs offer safety as they can prevent you from slipping on the wet floors. Besides, they also provide you with a comfortable and beautiful surface to walk on. So, washing the bathroom rugs is as important as cleaning all other things in your bathroom. Let’s go through all the things you need to know to wash your bathroom rugs. Before starting to wash your bathroom rugs, you should determine the type of bathroom rugs you own. The classification of bathroom rugs is generally determined based on their materials. 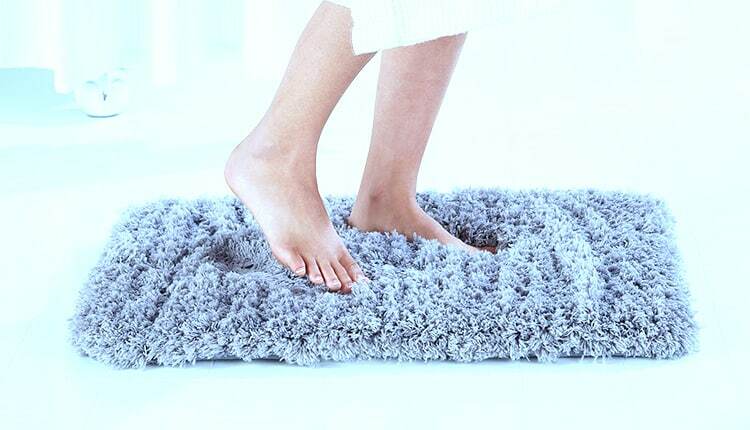 A bathroom rug or a bath mat can be made of any type of material. However, polyester, chenille nylon, cotton, and bamboo are more popular nowadays because they are easy to wash. The cotton-made bathroom rugs are thinner than the other types of rugs. They may vary by designs and sizes. There are some large bathroom rugs made of cotton. These large bathroom rugs are difficult to wash in a washing machine. So, you might have to wash them manually. The chenille rugs are not damaged easily even if they are constantly being soaked with water. These rugs are usually round shaped. If your bathroom is always wet, these rugs can give you solace. These round bathroom rugs are machine-washable. The polyester bathroom rugs are durable. If your bathroom is frequently used, you should opt for this bathroom rug. They are also easy to wash manually and with the machine as well. The nylon bathroom rugs are extremely durable. They also offer better slip-resistance. Target bathroom rugs have some good variety of nylon rugs. They are machine-washable. The bamboo rugs are durable and inexpensive. However, they do not offer a lot of variety and do not generally feel soft to walk on. They are not machine-washable, but they are easy to wash manually. Now, you know about the types of rugs that are easy to wash. You probably have one of those bathroom rugs. Although you know the kind of your rugs, don’t forget to check the care tags or laundry symbols to make sure that you don’t use any specific cleaning products, washing machine, or dryer that can damage your rugs. Lift your bathroom rugs and shake them a few times. Yuck!! You might feel repulsed and disgusted by the litter and dirt that can get out of them. Wipe off the plastic or rubber backing of the bathroom rugs using a piece of cloth. Now, start washing them with water and detergent or put them in the washing machine depending on the type of your rugs and laundry tags. Put your bathroom rugs in the washing machine with placid laundry detergent. Make sure you have a little free space in the washing machine. Wash the bathroom rugs on the cold setting. Don’t use the hot setting for these types of rugs. Dry the rugs setting the heat to the lowest. You can also hang the rugs outside to dry if you feel that they are not dry enough after drying with the washer. Don’t mix any other clothes or anything while you are washing the rugs or drying them. Turn the rugs upside down and check the undersides of them to see if the rubber is peeling or fissured. If the rubber has been cracked, then you should not think of washing it. It can be a loss of time and Buy a new one instead. If it is not cracked or peeling, then follow the next steps. Put the good rugs in the washing machine making sure that you have a free space in it. Wash the bathroom rugs on the cold setting in your washing machine with placid laundry detergent. Hang the rugs outside to dry or dry them on the lowest setting in your washer. Note : Never use heat or fire to dry plastic- or rubber-backed bathroom rugs because it can melt or crack the plastic or rubber. The bathroom rugs are a good place for all the germs, bacteria, and fungi to live on and spread their descendants. You don’t want them to make your bathroom an unhealthy place. So, you should wash your bathroom rugs as regularly as you clean the sink and the toilets. Washing bathroom rugs at least once in a week is ideal. If your rugs are always wet, you must wash them once in a week. However, if the rugs are not used that much, and they are dry most of the time, then you might do it once a month. To be honest, you should not leave your bathroom rugs unwashed for more than 12 to 14 days. So, make the time to do it.